The Museum of Applied Arts and Sciences holds the largest collection of material internationally of the aviation pioneer, Lawrence Hargrave. While no single individual can be attributed to the invention of the aeroplane, Hargrave belonged to an elite body of scientists and researchers (along with Octave Chanute, Otto Lilienthal and Percy Sinclair Pilcher) whose experiments and inventions paved the way for the first powered, controlled flight achieved by the Wright Brothers on December 17, 1903. Black and white print showing a Lawrence Hargrave flying machine in a museum with showcases in the background. The flying machine appears to be propped against a table. This black and white photograph was taken at the Museum of Applied Arts and Sciences in Harris Street, Ultimo, pre 1910. 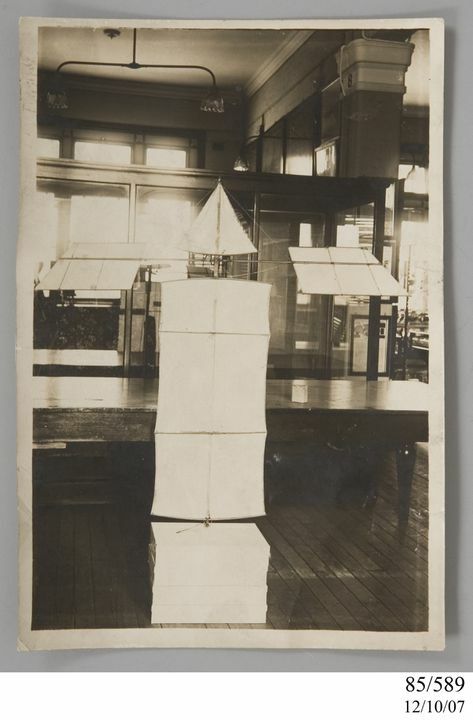 This photograph represents Lawrence Hargrave's duplicate 1886 flapping wing machine model or 'Experiment B' (B110). In 1888 it was sent by Hargrave to the Melbourne Centennial International Exhibition for display, before being donated to the Museum in 1891 by the New South Wales Commission for this event. At this same time, Hargrave also donated eight other of his models to the Museum. The original 'Experiment B' model produced by Hargrave at Rushcutters Bay was modified to become 'Experiment H,J,K' in 1887 (B112). This particular model, which was tested on June 27, 1886, was found to fly 170 feet by 197 ft pounds of energy stored in the stretched elastic bands. Hargrave's journal records that the nature of this flight was characterised by an undulating motion. It is a duplicate model that was initially made by Hargrave for the Royal Society's Conversazione in October 1886 and later sent by him for display in the 1888 Melbourne Centennial International Exhibition. It was then donated to the Museum in 1891 by the New South Wales Commission for this event. At this same time, Hargrave also donated eight other of his models to the Museum. The original 'Experiment B' model produced by Hargrave at Rushcutters Bay was modified to become 'Experiment H,J,K' in 1887 (B112). It is not certain why Hargrave sent the duplicate of 'Experiment B' for display in the Melbourne exhibition, since this was not his most successful flapping wing model produced before 1888. 'Experiment C', a 24 band machine, for example, was powered by 246 foot pounds which drove the machine 201 feet on February 9, 1887, while 'Experiment L', a 48 band machine, was powered by 470 foot pounds which drove the machine 270 feet on November 15, 1887. 'Experiment B', on the other hand, only moved 170 feet from 197 foot pounds of energy. It is possible that Hargrave did not want to submit any models to the exhibition that he was still in the process of modifying or that 'Experiment B' was simply the most convenient option, since the model had been shelved since its display in the Conversazione and was of little use to Hargrave anymore. Even though 'Experiment B' may not have been the most representative example of Hargrave's work, it was the most recent one he produced at the time it was submitted to the Conversazione. The second of four children of John Fletcher and Ann, Lawrence Hargrave was born at Greenwich, London on January 29, 1850. In 1856, Lawrence's father, eldest brother Ralph and uncle Edward emigrated to Australia in what appears to be a consensual marital separation between John and Ann. They were bound for Sydney to join a third brother of John and Edward, who was a member of the Legislative Assembly for New England (named Richard), while Ann, Lawrence and her two other children, Alice and Gilbert, stayed in Kent, England. During his early years, Lawrence was educated at the Queen Elizabeth's School in Kirkby Lonsdale, Westmoreland, before he sailed to Australia in 1865 to join his father, brother and two uncles. John Fletcher, who was a distinguished judge in the New South Wales Supreme Court living at Rushcutters Bay House, anticipated a career for Lawrence in law. Despite organising tuition for him, Lawrence failed to matriculate, but was subsequently accepted to begin an apprenticeship with the Australasian Steam Navigation Company (ASN Co) in 1867. For five years he worked as an apprentice, gaining invaluable skills in woodworking, metalworking and design. The circumnavigation voyage of Australia aboard the 'Ellesmere' (offered to Lawrence by another passenger en route to Australia from London) obviously stimulated an interest for Lawrence in exploration. From 1871, Lawrence joined the Committee of Management of J.D. Lang's New Guinea Prospecting Association and in 1872 was on board the brig 'Maria', bound for New Guinea in search of gold, when it sunk off Bramble reef, north Queensland, causing great loss of life. After returning to Sydney to work for the ASN Co, and later the engineers P.N. Russell & Co, Lawrence participated in several more exploratory voyages to the Torres Strait and New Guinea, accompanying figures like William Macleay, Octavius Stone and Luigi d'Albertis along the Fly River. These voyages continued until 1876, at which time Lawrence worked at the foundries of Chapman & Co, before choosing to settle down with new wife, Margaret Preston Johnson in September, 1878 with whom he had six children (Helen-Ann (Nellie), Hilda, Margaret, Brenda, Geoffrey and Brenda-Olive). In January of the following year, Lawrence commenced work as an extra observer (astronomical) at Sydney Observatory under the Government astronomer H.C. Russell. In this role, Lawrence was able to make a number of important observations and inventions, including the transit of Mercury in 1881, the Krakatoa explosion in 1883 and the design and construction of adding machines. The income made from land bestowed to Lawrence by his father in Coalcliff, however, meant that in 1883 Lawrence was able to resign from his position at the Observatory to pursue his fascination and study into artificial flight. This interest came about from his observation of waves and animal motion, including fish, birds and snakes. Lawrence's earliest experiments, spanning 1884-1892, involved propulsion with monoplane models built from light wood and paper. He first attempted to build a full-size machine capable of carrying a human in 1887 and in 1889 he built his most influential engine - a three cylinder radial rotary engine. Lawrence's later experimental phase, 1892-1909, involved the use of curved surfaces in his models. This research subsequently led to the development of the box kite, the most famous invention associated with his name. Lawrence always conducted his experiments in his local area (i.e. Rushcutters Bay, Woollahra Point and Stanwell Park). He was against patenting his inventions for fear of stifling the development of aviation in the bigger picture and therefore published his results quickly and widely, particularly through the Royal Society of New South Wales. This Society helped Lawrence to gain an international reputation and brought him into contact with other aviation pioneers like Octave Chanute and Otto Lilienthal. The very first paper he gave was "The Trochoided Plane" (delivered August 6, 1884). In Lawrence's later years he conducted research into early Australian history, postulating the theory that two Spanish ships found their way into Sydney Harbour in the late 16th century. Apart from this and of course his interests in aeronautics, Lawrence also concerned himself with the contemporary issues of patent laws, free competition, Darwinism, a bridge for Sydney Harbour, pensions, strikes and conscription. Lawrence Hargrave died of peritonitis at Lister Hospital on July 6, 1915. Lawrence's death came only nine weeks after the death of his youngest son, Geoffrey, at Gallipoli.